The SWITLIK MRP-10 Inflatable Marine Rescue Platform is an ideal product for getting multiple people to safety in a marine emergency. The quickly deployed and easy to board MRP-10 aids in getting large groups of distressed victims safely out of the water or down off a boat as quickly as possible. The MRP-10 is a breakthrough for professional Search & Rescue teams. The MRP-10 is the finest choice to help save large groups of people, quickly. All Title 14 CFR part 139 certified airports wanting to comply with the equipment requirement in the FAA 150/5210-13C water rescue circular can now do so with the Switlik MRP-10. The MRP-10 is 100% reversible allowing large groups to simple board the unit no matter which way it inflates. This is very important when you’re trying to quickly climb aboard the raft. 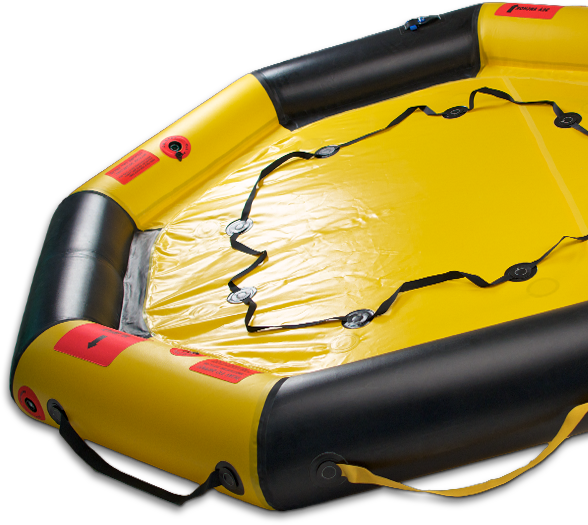 The Air Charge inflated platform provides provides over 1300 pounds of inflated buoyancy through its 12 inch diameter tubes and heat sealed floor providing flotation for 10 people. Multiple boarding straps surround the MRP-10. Along with its relatively low profile, and sturdy buoyancy tube, it is easy for any sized person to get up and out of the water.